When Mark and I left Guadeloupe northbound, we had two options: go “through the middle” with a visit to Montserrat and a short stop in St. Kitts and Nevis, or sail to Antigua and Barbuda for a few weeks. The volcano on Montserrat was acting up, with ash being spit out on boats in the vicinity, followed by days of cleaning up for the owners. That, and the fact that visiting Antigua and Barbuda on the way north is easier than on the way south, made us decide to go this route. 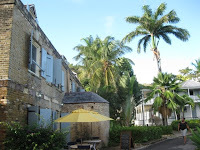 We had heard a lot of nice things about Barbuda and this island was our main goal, but first, we spent two nights in Antigua, where it is easier to check in and out. We anchored in Falmouth Harbour with the big objective to visit Nelson’s Dockyard National Park. This Heritage site of restored colonial buildings houses shops and businesses and creates a good feel for the old days. There is a short walk to fort ruins from where you have a nice view of English Harbor and its many anchored boats. This area is also very popular with the mega yachts and mega they are. During the day your neck gets stiff from looking up the immense, tall masts and at night the sky is dotted with red lights so planes don’t crash into them. The day we sailed to the sister island Barbuda, was pretty much perfect for this. 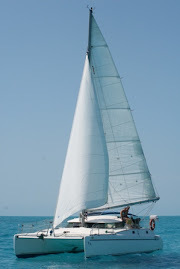 We followed the west coast of Antigua, noticing quite a few attractive bays near shore and once we hit open water, the wind was a steady 15 knots on the beam (side). Our little Irie was pushed forward at about 7 knots and life was Irie! 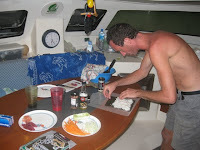 After cruising along for a couple of hours, our clothes pins snapped, meaning we caught a fish, or some other big thing. When Mark reeled the heavy hand line in, we saw a huge barracuda appear. In his struggle to get free, he had caught our other hand line, creating a giant mess. We managed to get the extra line off him, but needed to release him by cutting the hook. Nobody wanted to get close to those giant teeth and take the hook out. 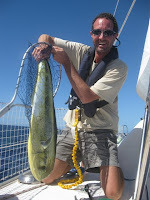 Then, when I pulled the other, damaged line in, something tugged on it… Totally unexpected, we had captured a tuna! Within a minute, we let go of one fish and caught another. Thank you, Mother Nature! The tuna came in handy the following days, since we didn’t provision in the expensive French islands before visiting “remote” Barbuda. It fed us for three meals, including a sushi dinner. 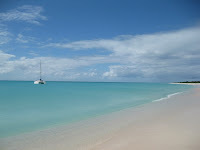 Barbuda is one of the few places in the Caribbean that is very low and therefore hard to see from a distance. While other, more mountainous islands are visible from 20, 30 or even 40 miles away, we didn’t spot Barbuda until we were within 5 miles of its shores. Once safely anchored, all we could see was sand, brush and water. 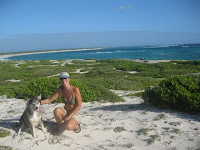 We spent our first night near Cocoa Point on Barbuda’s southwest coast. The long, quiet beach there has very soft sand in which you sink up to your ankles. When the wind picked up, we moved to the south coast, where the water is very protected. We had to maneuver through some reefs to find our preferred spot and got settled for about a week. Walks on shore revealed nothing more than barren land with sand, rocks and brush. There are a couple of salt ponds and nice views from a sand dune. Spanish Point offers a good look out over the crashing waves. Wild donkeys, horses and chicken roam the area and make up the other life to be found in the vicinity. 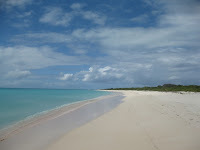 Low Bay on the west coast of the island is situated along an 11 mile stretch of pinkish sand. We expected other boats there, but in contrast to the other areas with a maximum of five boats, there was only one here: Irie! The beach was ours and we thoroughly enjoyed the solitude and the long walks with Darwin. Mark and I needed this little vacation away from it all to prepare ourselves for the busy times to come in St. Martin. Our stay in Barbuda truly charged our batteries and the fact that we were out of propane gas, fresh food, toothpaste, paper towels and other necessities didn’t matter that much. At least not for a few days. On the first day of February we sailed our last long trip in pretty light winds. We made it to St. Barth before nightfall, saw jumping whales along the way and caught our first mahi mahi (dorado). The following day, we reached the familiar lagoon in St. Martin and reunited with many friends, eager to join the fish feast on Irie. It is great to see this whole group of sailing friends again and have a good time. Another working era has arrived and we will be doing just that for about three months before picking up the cruising life again. And, in the evenings, there are plenty of opportunities to socialize!